Ask most any bar owner, brewer or – for that matter – any restaurateur about their business in January and February and you’ll likely see frowns, head shakes and encouragement for a new line of questioning. Hunkering down at home is a favored January activity for many of us. Magnolia Pub brewer Andrew Combs on the 21A brew deck, brewing the 21A and Magnolia collaboration beer, Smog Monster. What to do? A few enterprising beer industry leaders figured it out. Starting in 1993, Dave Keene, owner of Toronado, started its annual Barleywine festival on the Saturday before Presidents’ Day. (It has now moved to the autumn). In Hayward, The Bistro’s Double (and now Double/Triple IPA Fest), the first in the world, began kicking off February’s beer fun in 2001. From 2005 to 2014, “The Beer Chef,” Bruce Paton led a beer and chocolate dinner at the old Cathedral Hill Hotel. Rogue Brewing Public House starting hosting beer and cheese-pairing events. Tom Dalldorf, publisher of the Celebrator Beer News, spearheaded a festival at Trumer Brewery, first held to celebrate its 15th anniversary in 2003. In fact, according to local beer writer Jay Brooks, The Celebrator promoted a week-long February celebration of craft beer dubbed Beerapalooza, which incorporated all of these events. In 2002, two San Francisco brewpubs, 21st Amendment and Magnolia Gastropub, began a collaborative venture they called Strong Beer Month. The concept was to have each brewery concoct six strong beers to serve at its pub throughout February. A punch card was given to each customer and upon drinking all 12 beers they would get to keep the specially made goblet in which the beers were served. The advertising included an iconic collectible poster modeled after rock and roll album covers featuring the owners and brewers standing in for the musicians. Strong Beer Month is going, well, strong to this day. We dropped in at the 21A pub during the brew day of their collaboration beer, Smog Monster Double Hazy Smoked IPA. Why February? 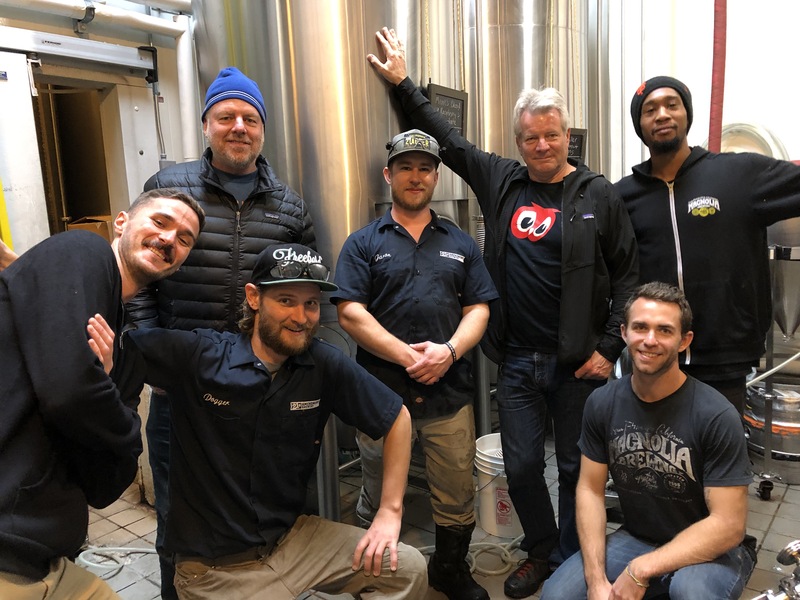 “Dave McLean, then owner of Magnolia Brewing, and I were looking for a better way to bring more people into our pubs in February, which is typically the slowest month of the year,” said 21A co-owner Shaun O’Sullivan. SF Beer Week has headlined February since 2009, but it actually was cleverly grafted onto these several pre-existing, attention-grabbing events. That year, a group comprised of the above-mentioned folks got together to formulate an even bigger way to blast into fight winter doldrums. After a trip to Philadelphia during the first Beer Week in the country, Brooks and Dalldorf thought that it was a model that could be replicated in San Francisco. And so it was. Using the already organized events as mainstays, the group sent out a call for other breweries and pubs to join the party. In all, about 150 events took place during the first SF Beer Week. There was no Opening Gala event, simply a kick-off gathering and toast for media and industry folks at Anchor Brewing. Now that it has grown into a Bay Area-wide ten-day party, managed by the Bay Area Brewers Guild, we have over 900 events to choose from, including a huge opening gala festival and most of the original events that served to entice us back into bars and breweries during what passes for winter in the Bay. Each location opens around midday (check their websites) so you can drop by any time during SF Beer Week… or after. Happy SF Beer Week and Strong Beer Month! Explore Beer By BART: Use our list of some of the San Francisco Bay Area’s best beer places and their related transit info, so you can get out there to enjoy without driving.